The espresso tamper is a small accessory that you use to compress the ground coffee in your espresso portafilter. In turn, this produces a tastier and more consistent espresso. This accessory is often the secret touch of many expert espresso baristas. Of course, if you already own an espresso machine then you probably also have a plastic tamper. After all, most espresso coffee machines ship with one these days. 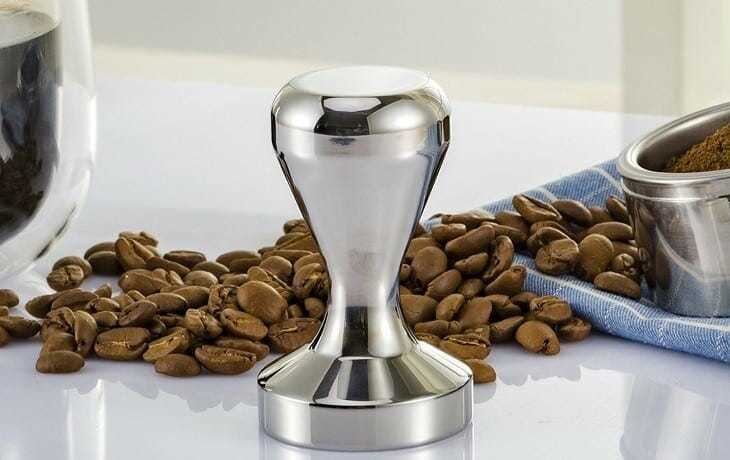 However, it will be nowhere near as effective as a traditional metal tamper that you will find in our espresso tamper review below. Without any further ado, let’s see which espresso tamper you need to buy right now! 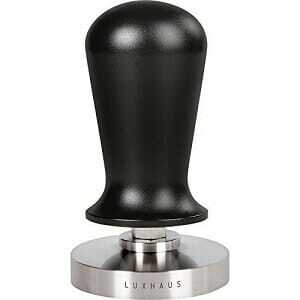 The LuxHaus is a popular calibrated espresso tamper that is made from food-safe stainless steel. 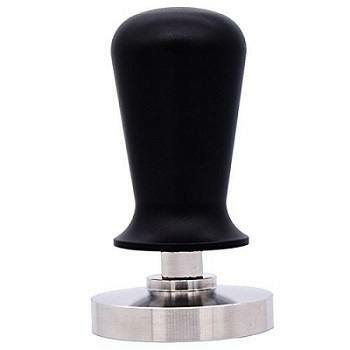 This material is also highly durable, long-lasting, and will not react with your coffee making it a suitable espresso tamper in both a commercial as well as the personal setting. What separates this model from the rest of the competitive and is its premium look an eye for detail. Indeed, you can easily tell that this espresso tamper has been built with care and a lot of know-how. The size of 49 mm is ideally suited for your regular espresso machine’s portafilter as it is pretty much a standard size. However, if you need more versatility, then you can find another model that comes in 51 mm. When it comes to the ease-of-use, the LuxHaus is very easy to use, and the handle is quite ergonomic. 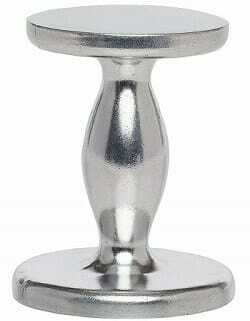 You will definitely not experience hand fatigue even if you use this espresso tamper for an extended period of time. Therefore, this model is an excellent choice for almost anyone, whether you are an amateur coffee lover or an expert barista. The Feenm has been built in such a way that it can be used as a heavy-duty tamper. Most baristas who work in a professional setting and have to prepare hundreds of cups of espresso every day usually end up with a major problem which is not being able to deliver a consistent tasting espresso. This is where the Feenm comes into action. Since it is a calibrated tamper, it has a small spring inside allows it to exert a uniform force on your ground coffee regardless of how hard you press on the handle. In fact, each press will result in exactly 30 lbs of pressure at the base which is powerful enough to compress a thick layer of ground coffee in the portafilter. This results in a more consistent tasting espresso. 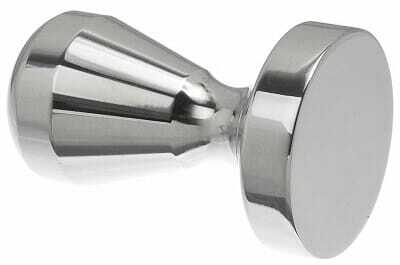 Furthermore, this tamper is made from a 304 stainless steel metal which is very durable and long-lasting. It will also not rust or corrode over time. Andy since this is a heavy-duty tamper, extra care has been given to the handle as it is quite ergonomic and made from a heavy-duty plastic that will last a long time as well. All in all, as long as the internal diameter of your portafilter is 58 mm, this model by Feenm remains one of the best espressos tampers for the money. What distinguishes this espresso tamper from the rest of the competition is its all-metal build construction. Indeed, this tamper is made from a solid iron material with a chrome plated finish that makes it aesthetically pleasing. Moreover, the chrome finish is corrosion-free even when it comes in contact with water. The design has been machine engineered for detail, and it does have some premium look, despite its highly inexpensive price. In fact, the Apexstone is one of the most inexpensive 51 mm espressos tampers you will encounter in its review. The only caveat we note with this tamper is that it weighs 20.5 oz, which is heavier when compared to other models. However, its fairly average size of 51 mm is a good match for its weight which does not make it uncomfortable when used. If you are freshly starting out and need an affordable espresso tamper, then the Apexstone is an excellent model for the money. When it comes to size, the Benicci is definitely the biggest model that you can find. Indeed, the base of this espresso tamper measures an impressive 58 mm. This size is most suitable for American espresso machines that usually have a 58 mm diameter in their portafilter. It’s a big size of 58 mm also comes with a big weight of 23.2 g. In fact, the Benicci is also the heaviest espresso tamper in this review. If you like to feel your espresso tamper in hand, then this is an excellent choice. However, it can be more difficult to maneuver especially if you have to prepare a lot of cups of espresso every day. 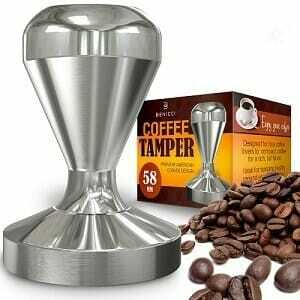 Moreover, it is also quite expensive when compared to other tampers we have reviewed so far. However, the excellent build construction from a solid and food safe stainless steel, its convex base, and ease-of-use makes up for its high price. Not everyone can afford an expensive espresso tamper. In fact, not everyone actually wants to invest in an expensive model because most espresso machines already come with a plastic espresso tamper. This is where models like the HIC Harold comes into play. 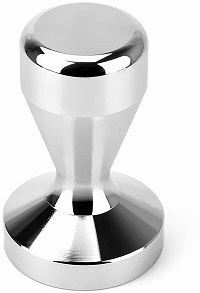 Indeed, this top-rated espresso tamper is the most inexpensive model that you will encounter in this review. Despite its very low price, it is still made from a corrosion-free aluminum material. But where this model absolutely shines is in its versatility. It has 2 bases, one that measures 50 mm and the other 55 mm. Very neat! The only caveat we note with this tamper is that it does not have a dedicated handle. Therefore, it is not as comfortable to hold when compared to other models. In addition, its lightweight of 4 oz means that you will have to apply more force to compress your ground coffee in the portafilter. Nevertheless, the HIC Harold makes up for all this as it is the cheapest espresso tamper that you can buy. If you are on a short budget, this is the model to get. The Omgogo is a popular model that is regarded by many users as one of the best espressos tampers you can buy. This is because this model sports an excellent price to quality ratio. The handle is made from Rosewood and is quite ergonomic. You will have no difficulty maneuvering this tamper at all. Especially considering its low weight of 8.8 oz which makes it a breeze to handle. However, you will need to apply more force to compress your ground coffee with such a low weight. Furthermore, the size of 49 mm is an ideal size because it is pretty much an industry standard and most home espresso machines, as well as some commercial ones, use a 49 mm portafilter. In addition, the base is made from food-safe stainless steel which is durable and long-lasting. The BlueSnail is a 51 mm espresso tamper that is made from high-grade stainless steel on the outside and iron in the inside. This difference in material is what explains its relatively affordable price when compared to other tampers made exclusively from stainless steel. However, this espresso tamper is quite stylish and aesthetically pleasing. But what we like about this product is that it had good attention to detail and made with care. The base of 51 mm is compatible with most consumer grade espresso machines. Furthermore, it is able to apply decent pressure to your ground coffee to compress it. The caveats we note with this product is that it does not have a spring system inside to make the compression more consistent. Moreover, it is not unibody, and you can unscrew the handle from the base. It does lack this “premium feel” to it. But except for this small caveat, this tamper is an excellent purchase an ideal for both amateur and expert baristas. It will definitely make a superior coffee when compared to your regular plastic espresso tamper. This espresso tamper is shipped in a plain box. It is also not a unibody espresso tamper, and you can easily unscrew the handle from the base. There are basically 2 types of espresso tamper on the market. The flat and the convex tamper. Choosing between those 2 types of espresso tampers is purely a technicality because they differ only in appearance but technically do the same job. The flat espresso tamper has a flat base and when pressed against the portafilter will create a uniform and perfectly flat ground coffee. On the other hand, the convex tamper, as its name suggests, is slightly beveled from the center of the tamper up to the edges. Such that when pressed against the ground coffee, it produces a slightly convex compressed coffee in the portafilter. The main advantage of the convex tamper is that the slightly convex edge of the coffee prevents water from entering the portafilter which can potentially ruin your shot. However, you can achieve the same result using the flat tamper. Indeed, all you need is using the right technique and right movement when pressing the ground coffee against the portafilter. The size of the espresso tamper is measured in millimeters, and it is exactly the size of the internal diameter of your portafilter. When purchasing an espresso tamper online, size does indeed matter. This is because the portafilter of commercial espresso machines has a different internal diameter than that of a home espresso machine. In most cases, the size of the espresso tamper will vary from 49 mm to 58 mm when it comes to your regular home espresso machine. You must measure the size of your portafilter or refer to your espresso machines user’s manual to know the size you need to buy. The weight of your espresso tamper will make all the difference in the world. In fact, this is one of the little secrets that many expert baristas keep to themselves. Indeed, using an espresso tamper with the right weight is extremely important! However, keep in mind that being too light is not necessarily a good thing when it comes to the espresso tamper. Most of the time, you will be satisfied with an espresso tamper that weighs anywhere from 10 oz to 25 oz. Also, remember that a heavier espresso tamper will require less force applied to it because the extra weight plays to your advantage. Nevertheless, it is more difficult to maneuver than a lightweight tamper. Essentially, the material used in the build construction of your espresso tamper will dictate how long and durable it is. 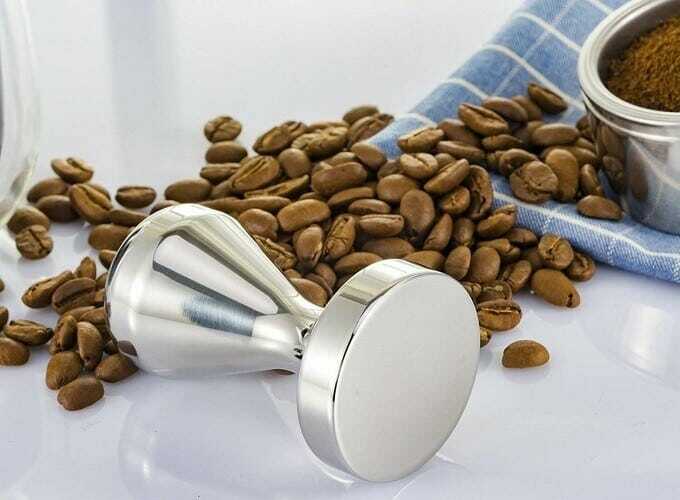 Most quality and reputable espresso tampers are made from stainless steel which is a very durable and long-lasting material. Additionally, it does not react with your coffee and is very easy to clean. This makes it food safe and more hygienic when compared to other materials. However, stainless steel is a bit heavier than a material like aluminum, for example. A calibrated espresso tamper is simply a tamper that has a spring attached between the base of the tamper and the handle. One of the main advantages of this calibrated tamper is that it allows you to apply the same force every time you press on the handle. Therefore, the result and taste of your espresso are more consistent when compared to a non-calibrated tamper. The only caveat is that the calibrated tamper is more expensive than a regular model. Ensure that the handle of your espresso tamper is well-built and made from a material that is durable and long-lasting. Additionally, it should also be quite comfortable as well. This is especially important if you will be using the tamper for an extended period of time. 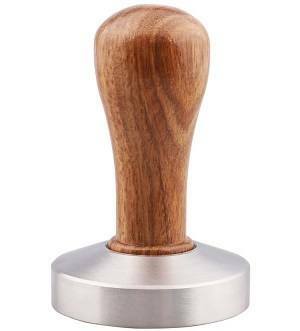 Most quality tampers use a high-grade plastic, wood or even metal for the handle. Even if the espresso tamper is not necessarily a very expensive coffee accessory, prices can quickly get out of hand. We recommend that when purchasing an espresso tamper, you set a specific budget and try to stick to it. The Espresso tamper is a vital accessory in the espresso brewing process. It will boost the quality of your Espresso and makes the taste a little bit brighter and smoother. If you already have an Espresso machine in your kitchen, then it probably came with a plastic tamper. But if you’re serious about your Espresso, then you definitely need to invest in a high-quality tamper as it will make a world of difference when tamping your ground coffee in the espresso portafilter. Our espresso tamper review above contains some quality tampers that are absolutely worth it. Check them again if you haven’t decided yet!